This case study presents reflections on a research intervention conducted at the Dutch Ministry of Foreign Affairs. The subject was the practice of administration. Its objective became to understand its “wicked problems” and to create action principles. It was an analytical research effort as well as a learning intervention. Wicked problems are those that have a large impact on an organization’s functioning and that persist regardless of numerous efforts to remedy them. They are characterized both by content and process complexity and are by no means exclusive to the Ministry. 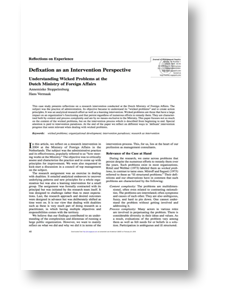 This paper focuses not so much on the content of the wicked problems, but on the intervention process which is described from beginning to end. Special attention is paid to intervention paradoxes. At the end of the paper we reflect on different ways to ‘defixate’ intervention progress that seem relevant when dealing with wicked problems. The article was introduced by D.W. Jamieson and discussed by both C.G. Worley and R.J. Marshak both of whom raised some contentious issues. Tot these we responded. The debate between us and Worley is especially worthwhile: it discusses whether an activist approach by OD practioners is unethical or not. All these four texts ‘sandwiched’ the main article. To read these additional discussions and reflections, click here.